Image: The base of a wind turbine – tonnes of iron ore, cement processing, and land destruction. 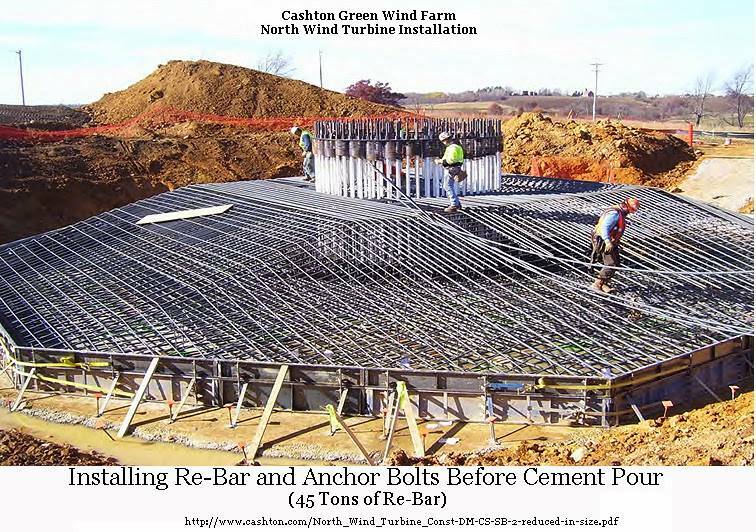 This very impressive research and analysis on the energy requirements and the CO2 emissions for one wind energy capturing device (wind turbine) should be sobering, and disturbing – just the rebar and concrete used for the base of a 2.5 megawatt structure! This, on top of enormous and ongoing land destruction for so-called wind farms. (And even “small” turbines do not return their energy or dollar investment during their entire life cycle, as reported elsewhere). Though it would be elegant if wind and solar energy capturing devices could actually maintain a modicum of the wonderfully rich lifestyles many of us live, this is a delusional dream (“greenwashing”) that centers on perpetuating the industrial culture that got us into the mess we’re in. BAU (business as usual) is not sustainable or “green” nor really desirable for the future of the earth or even our species. The picture of the rebar base says it all – and the charts expose all the industrial profiteering and fossil-fuel exploitation involved. Deep Green Resistance is opposed to ALL industry. We have faced the fact that A: there is no “clean” fossil-fuel derivative (which so-called solar, wind, hydrothermal, and nuclear are) and B: we are out of time, the biosphere is in its death throes. Industry needs to stop, and humans need to change the way we live with the earth. If you are new to this subject, don’t worry – many DGR Members also had bright hopes for some “no-impact high-tech ecotopia” some years back. Check out our FAQs on so-called “Green” Tech. This entry was posted in Climate Change and tagged Energy, Greenwashing, Wind on June 25, 2015 by DGR Editor. Erik Lindberg of Transition Milwaukee recently posted a good deconstruction of several common “progressive” fallacies around climate change. Climate change is a systemic problem created by our high consumption way of life, and can’t be solved while maintaining that way of life. Liberals and progressives often blame Republicans or conservatives for getting in the way of solutions, but the solutions on the table are ridiculously inadequate to address the issue and constitute another form of denial. Unfortunately, Myth 6: “There is Nothing I Can Do” only discusses personal reduction in consumption, not the organized resistance necessary to stop the destructive system of industrial civilization. For a much more thorough treatment of “what I can do”, read the Deep Green Resistance strategy of Decisive Ecological Warfare. Otherwise, though, this is an excellent analysis. The upshot of the previous sections is that the comforts, luxuries, privileges, and pleasures that we tell ourselves are necessary for a happy or satisfying life are the most significant cause of global warming and that unless we quickly learn to organize our lives around another set of pleasures and satisfactions, it is extremely unlikely that our children or grandchildren will inherit a livable planet. Because we are falsely reassured by liberal leaders that we can fight climate change without any inconvenience, it bears repeating this seldom spoken truth. In order to adequately address climate change, people in rich industrial nations will have to reduce current levels of consumption to levels few are prepared to consider. This truth does not change according to our ability to stomach it. This entry was posted in Climate Change and tagged Liberal & radical on December 1, 2014 by Deep Green Resistance Wisconsin. July 29, 2012, 2:10 p.m.
ANN ARBOR, Mich. — Enbridge, a beleaguered Canadian oil pipeline company, has spilled more than 50,000 gallons of light crude oil in rural Wisconsin — shortly after the company said it had implemented safety reforms after a massive 2010 spill in Michigan. Officials for Alberta-based Enbridge Inc., one of the United States’ most vital suppliers of Canadian oil, said Friday’s spill has been contained by cleanup workers, who are now trying to repair and restart the 24-inch pipeline known as Line 14, which carries more than 300,000 barrels a day. The incident is another black mark for an ambitious energy company ridiculed earlier this month by U.S. safety officials, who likened Enbridge workers to the Keystone Kops. The comparison came after an investigation of a broken pipeline that released more than 800,000 gallons of heavy crude near Marshall, Mich. — one of the largest inland oil spills in U.S. history and certainly the most expensive. The new spill, in sparsely populated Adams County, Wis., forced the evacuation of two homes. It is the company’s worst spill since the 2010 disaster, and it drew the ire of U.S. Rep. Ed Markey (D-Mass. ), ranking member of the House Natural Resources Committee. This entry was posted in Toxification and tagged Enbridge, Energy, Industrial "accident", Oil, Pipelines on August 1, 2012 by Deep Green Resistance Wisconsin. Time running out on our ability to preserve a livable world. Is it just me, or has it been a little warm around here lately? Or warmer earlier? The early and unusually mild spring here in Wisconsin may be nature’s way of reminding us that the clock is ticking on climate change and we need to take action before it’s too late. While stationed in Kangerlussuac, Greenland, 50 years ago, I noted my airbase was 4 miles west of the Russell Glacier grinding down from the ice cap. Looking at today’s satellite images, this glacier has retreated to the east toward the ice cap, easily noted from the satellite. The retreat averages 1,000 feet per year, producing a torrent of melt water that flows down the fjord and to the sea. Glacial retreat is one indicator that global warming is taking its toll. Today, in more populated areas of the earth, disappearing glaciers are responsible for drought, loss of irrigation water and less drinking water. As much as 54 cubic miles of ice disappear each year in Antarctica, 24 cubic miles per year in Greenland. As this ice melts, ocean levels rise and coastal regions flood. Centuries of rising CO2 levels and other greenhouse gases have raised the Earth thermostat. Irish scientist John Tyndall discovered CO2’s threat as a heat trapping greenhouse gas in the mid-19th century. In the 1950s, Dr. Charles Keeling began meticulous measurement of atmospheric CO2 levels at Mt. Muana Loa Observatory in Hawaii. Keeling and his son, Ralph, documented the steady buildup of CO2, which stood at 315 parts per million (ppm) worldwide when they started and is now 392 ppm. This entry was posted in Climate Change on June 30, 2012 by Deep Green Resistance Wisconsin. It appears influence peddling is alive and well in Wisconsin. 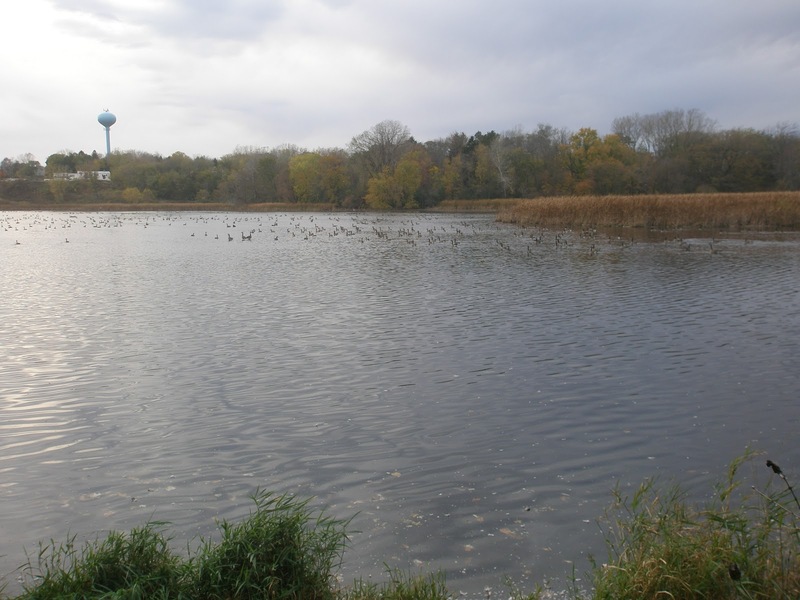 See the article below about one of the Governor Walker’s top appointed officials at the WDNR stepping in to let a polluter off the hook for over $37,000 in fines. Milwaukee Riverkeeper disagrees, believing if we are to deter future violations (a good thing even according to Governor Walker), then penalties must be sufficiently large to punish the polluter. For more information see the article below. This entry was posted in Toxification and tagged Scott Walker, Wisconsin, 11: Civilization is a culture of occupation on May 16, 2012 by Deep Green Resistance Wisconsin. In a match that some would say was made in hell, the nation’s two leading producers of agro-chemicals have joined forces in a partnership to reintroduce the use of the herbicide 2, 4-D, one half of the infamous defoliant Agent Orange, which was used by American forces to clear jungle during the Vietnam War. These two biotech giants have developed a weed management program that, if successful, would go a long way toward a predicted doubling of harmful herbicide use in America’s corn belt during the next decade. This entry was posted in Agriculture, Toxification and tagged Human health, Pesticides on March 2, 2012 by Deep Green Resistance Wisconsin.